Past Chapter President, and Director, John A. Yohn, 81, passed away at 6:30 p.m. Tuesday, August 24, 2010, in Tavares. John also served as a member of our Color Guard, and was active in the Adopt a Kid/Adopt a Vet program, with several of his students having been selected with the winning essay. John was born Nov. 18, 1928, in Canton, OH; his parents were Wilson and Isabella Yohn, who preceded him in death. John graduated from Lincoln High School in Canton, and lived and worked in that area until 1974, when he moved permanently to Lakeland FL, where he owned and operated a Pack and Ship store. 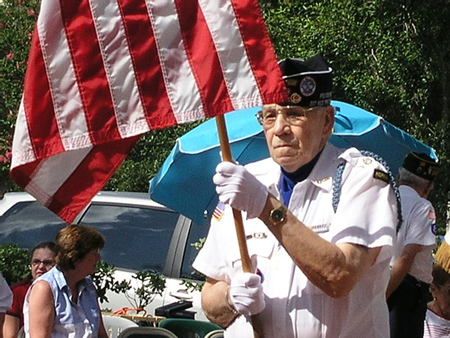 In 1995, he retired and moved to Leesburg with his wife, Myrna. John served as a gunnery Sgt. in Korea 1950-52 with Company A of the 987 AFA BN, seeing heavy hand to hand combat after the Chinese intervention. The deceased was married in 1950 to Myrna Barstow who preceded him in death. His second marriage was to Alta Bonk in 2004. He was a member of Lake Square Presbyterian Church in Leesburg, the American Legion and the Korean War Veterans Association. He is survived by his wife, Alta; and cousins in Ohio. 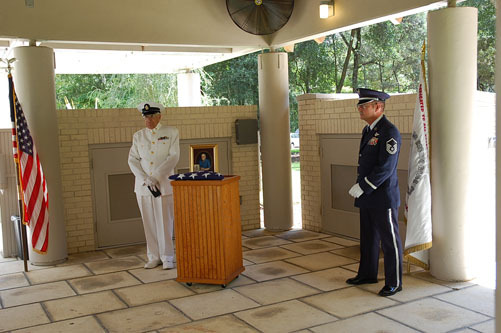 He was buried at Florida National Cemetery in Bushnell on Thursday, September 2. Memorials may be made to: Cornerstone Hospice in Tavares, FL. He is survived by his wife Alta Yohn, 27404 Orchid Glade St., Leesburg, FL, 34748, (352) 323-1896. Portions extracted from the Daily Commercial, Leesburg, FL, 8/27/2010. 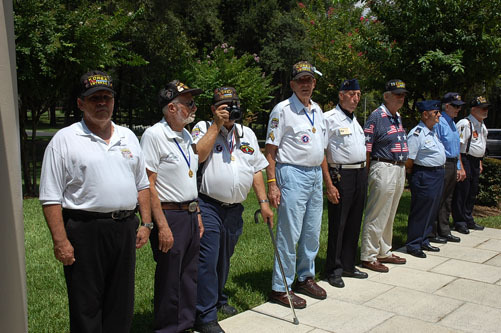 Florida National Cemetery, Bushnell, FL, Sept. 2, 2010. We were gathered at this beautiful cemetery today to honor and reflect on our departed brother, John Yohn, who passed away on August 24. John’s wife Alta, several relatives, friends and neighbors, a goodly contingent from our Korean War Veterans chapter, and a team assembled locally to conduct the ceremony had come together to pay final respects to John. Everyone was silent, me included. Although I didn’t know John very well, I should have said a lot. Like for example that he and I were born 43 days apart—both in Ohio—he in Canton and me in a small town 123 miles west on U.S. Highway 30—Upper Sandusky. And that some 75 years later we came to know each other here in Lake County, FL. And that in 1950, we both were thrust into our Nation’s “police action affair” thousands of miles around the world in a place neither of us had heard of, Korea. Since John was in the National Guard, he arrived there a bit before me, and experienced the onslaught of the Communist Chinese Peoples Volunteers a few months before I, who was invited by President Truman to “represent my friends and neighbors in the armed forces of the United States,” i.e., I was drafted! But John and I, and several of our fellow Chapter members here today as well, heard the same sounds of the attacking CPV—the bugles and whistles in the pitch black of the night, the red and green tracers, and then the wave after wave of human attackers! And the stack of their dead often piled several deep just where they fell. And we experienced the loss of many buddies and friends too, especially when we became the attackers in this seemingly endless, senseless affair! And I should have said that we each went on do what we were called upon to bring that three-year conflict now legally named the “Korean War” to a successful cessation of hostilities in 1953. We came home and for the most part without fanfare blended back into the “normal” life of working, raising families, and being productive American citizens. We didn’t tell many if any, including our families and children, where we had been and what we did. Then little by little we began to realize that what we had done almost 60 years ago was one of the most significant undertakings in our nation’s history, for it was one of the first nails in the coffin of a major effort then underway to capture the minds, bodies and souls of free men—communism! But later on we began to look for and find our friends and buddies who had experienced the same event—sometimes even extended to finding some of those 36,000 Americans that left their blood and lives on the Korean soil—and together began to tell America our story! Sadly, we found many historians and educators and journalists and even political leaders, routinely ignored our contributions to Freedom and to "… the Republic for which it stands, one nation, indivisible, under God, with liberty and justice for all." So, I thank John for his contributions to our efforts—both 60 years ago and much more recently as well. And I thank all of you here today as well. To Alta and family, I thank you for sharing John’s precious time with us and for supporting our cause. And to those of you conducting this ceremony today, I thank you for sharing your time in remembering John. And I want to thank our nation and the Veterans Administration for enabling John to rest eternally in this most hallowed and beautiful place. 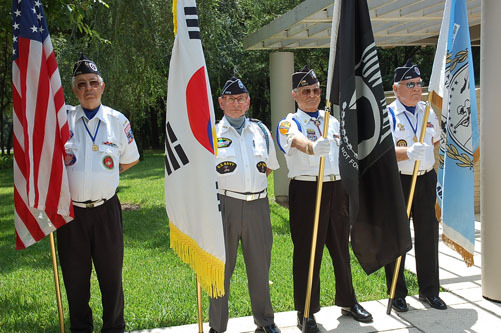 And finally I want to thank my fellow Korean Vets for coming today and for sharing your time and I ask those of you who remain to carry on this effort to rightfully place our Korean War contributions forever in their proper perspective in our nation’s minds and hearts and histories!